This villa has four bedrooms, three baths - two Master En-suites - with a 30 foot by 15 foot southeast-facing private pool, free high-speed internet (WiFi), 42' LCD TV, and game room. 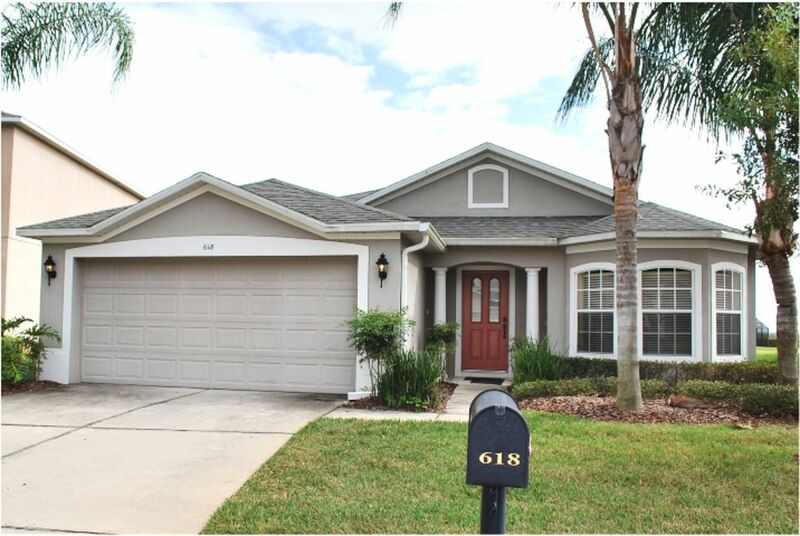 It is conveniently located in Hamlet at West Haven, a gated community next to Champions Gate Golf Resort (two golf courses) off I-4, just four miles (one exit away) to the main gates of Disney World. This 2011 square feet villa is very roomy and bright, owed to its cathedral ceilings and bay windows design by US Home - the #1 home builder in the region. It is just recently replaced with all hardwood flooring, and luxuriously furnished and beautifully decorated by the professional interior designer. The villa has two master en-suites with its own large private bathroom, one with king-size bed and one with queen-size bed, two guest rooms with two twin beds in each, and a queen-size sofa sleeper. It comfortably sleeps up to ten people. The southeast facing swimming pool brings in the beautiful Florida sunshine all day long. The elevated location enables a perfect fireworks view from Disney world in the backyard. The pool can be optionally heated. The Lanai is fully screened to keep the bugs out while allowing the sunshine to come in. The pool also comes fitted with a child safety fence and gate. The kitchen is fully equipped with an open bar, a beautiful separated dining and a breakfast nook. Phones, Cable TVs, a DVD, VCR, Gamecube in the family room. Bed linen and towels are provided. Separate laundry room with washer and dryer. High chair, crib, and stroller are also available. Barbecue grill is free of use. The local phone call is free. High-speed internet with wireless network is free of connection and use anywhere in the villa. There is a game room with a full-size pool table for entertainment. Great location, plenty of room Quiet and clean neighbourhood! The home is beautiful and in a quiet neighborhood. The owner responded quickly to questions we had prior to arrival. Very spacious and fully equipped for your cooking and dining needs. Our family enjoyed the stay, and would always consider when vacationing in Davenport again. We all thoroughly enjoyed!!! I am giving this a three star because I loved the location, loved the subdivision and the layout of the house. However, the furniture in the house were not comfortable at all. I was disappointed in the kitchenware and lack of serving bowls, cook ware, pots etc. Opon arrival the house was filthy. I would never stay again. The pool was loaded with algae at the bottom good thing we didn’t pay for pool heat. The floors didn’t look like they been mopped since the house was built. The bottom of our socks were black. The house was loaded with ants. When you pay that kind of money the house should be cleaned properly..Very disappointed!!! Great property location,excellent home. Nothing to complain. I am so glad you've enjoyed your stay. Thank you for renting my vacation home. I have been doing my best to keep the house like my primary home. I want all my guests to stay here as a home away from home. I look forward to having you back again. Clean and comfortable. However, the WiFi didn't work, which was very disappointing. Also, while this wasn't an issue in winter, renters should be aware that the AC isn't rated to cool below 75-80 degrees. Many people will find this uncomfortable in midsummer. Still, a clean, well-kept option in the pet friendly range.